TOKYO (Reuters) - As U.S. President Donald Trump dealt a blow to China with plans to slap tariffs on $60 billion of trade, he quietly delivered a slap in the face to one of Washington's closest allies, Japan, which got no exemption from earlier announced duties. The move to exclude most U.S. allies, but not Japan, from steel and aluminium tariffs that took effect on Friday is an apparent snub to Prime Minister Shinzo Abe, who has assiduously courted Trump since he was elected. U.S. Trade Representative Robert Lighthizer also ratcheted up pressure for a bilateral trade pact with Tokyo, which has been in sporadic talks with Washington on cutting Japan's trade surplus. Abe was the first foreign leader to travel to New York and meet Trump in the days after the November 2016 election, when he presented him with a golf club worth nearly $4,000 and showered praise on him. Officials tried to put a positive spin on the trade spat, which comes just as Tokyo seeks to coordinate its North Korea policies with those of Washington, an effort complicated by an ever-changing cast of characters at the White House. 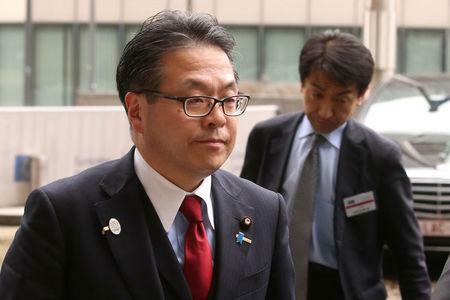 "We are aware that U.S. Trade Representative Lighthizer has been saying the U.S. wants to negotiate a free trade agreement," Japanese trade minister Hiroshige Seko told reporters on Friday. "I understand we will have constructive talks on what's the best framework for Japan and the U.S. as well as the Asia-Pacific region under Japan-U.S. economic dialogue. We want to closely communicate with the United States." Trump signed a presidential memorandum on Thursday targeting up to $60 billion in Chinese goods with tariffs after a 30-day consultation period that starts once a list is published. China responded strongly and the escalating tension between Beijing and Washington hit financial markets, with investors fearing dire consequences for the global economy if trade barriers start going up. Lighthizer on Thursday read out a list of countries with which the U.S. was negotiating exemptions from the earlier announced tariffs, among them Argentina, Australia, Brazil, the European Union and South Korea. "Retaliation against the U.S. trade measures could destroy the free-trade system," Seko said. "It is extremely important that Japan calmly seeks solutions under the framework of the WTO," he added, referring to the World Trade Organization. Japan, one of 11 countries that signed a new Trans-Pacific trade pact this month after the U.S. withdrew last year, may eventually sign a free trade deal with the U.S., said Junichi Sugawara, a trade policy researcher at the Mizuho Research Institute. "Japan probably does not want take a harsh stance considering the relationship over security issues with the United States," he said. "There is a chance that Japan will eventually have to start bilateral free trade talks ... even though Japan's goal is to get the U.S. to return to the TPP."